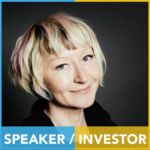 John Biggs will host a fireside chat with Zoe Adamovicz, CEO and co-founder at Neufund. Neufund is an end-to-end solution for assets tokenization and issuance. The company recently announced the world’s first offering of tokenized equity available to the general public. To date, Neufund has onboarded over 3000 investors from more than 90 countries and secured an equivalent of more than €12m for future investments through its platform from investors like Frank Thelen (Freigeist VC), Christophe Maire (Atlantic Labs), Alexander Lange (Index Ventures) and Max Kordek (Lisk).